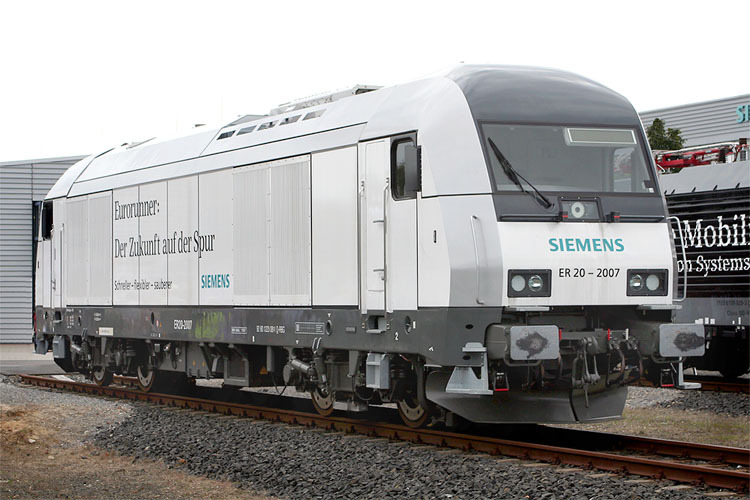 For testing and promotional purposes, Siemens built an extra EuroRunner locomotive in 2007. The white and silver painted machine, matching the corporate identity of Siemens was completed in April 2007. Technically the machine represents the ER20BU subtype, with minor modifications: the machine has small destination displays behind its right front windows and it is equipped with radio control, which can be derived from the fact that the machine has small blinking lights on every cabin corner. The machine made a short public appearance at the Siemens test centre in Wegberg-Wildenrath in August 2007. The centre opened up its doors for the public that month. Then it became rather quiet around the silver and white locomotive, being stored in München-Allach until the summer of 2008. From July 2008 to July 2009, various German operators like WLE, MWB, Railion, RAN, RBG, Eichholz, and e.g.o.o evaluated the ER 20-2007 in revenue service. At the WLE the ER 20-2007 helped out while WLE 22 was refitted with radio control. Then the machine travelled to the Czech Republic for trials, ending up in Wegberg-Wildenrath afterwards. On 01.09.2009 the locomotive arrived in Hungary, where it received the Mirel signalling system, for tests by GySEV. With Mirel the ER 20-2007 can be operated in countries such as the Czech Republic, Hungary and Slovakia. In November 2009 the unit was transported to Slovakia, where it was handed over to the local subsidiary of operator LTE. 2010 and 2011 were the last two years as a demonstrator loco for ER20-2007. On 12.05.2011 it was sold to the Siemens test centre in Wegberg-Wildenrath, which primarily uses the loco to haul transports of rolling stock to and from the test centre. Six months later the loco was renumbered PCW 7, according to the test centre’s numbering scheme. Also the loco was given a fresh blue appearance.